​No. 33 Fresnel Lens. Humboldt Bay Maritime Museum, Samoa. The challenge of lighthouse lens makers was being able to make a very large lens that would send a beam for miles that was practical to make. It needed to be very large, but couldn't weigh very much, and it needed to withstand the heat from a large lamp on one side and the cool air on the other without cracking. Fresnel (the "s" is not pronounced) knew that light refracts only at the surface where light goes from one medium to another. Taking this knowledge and amazing skill, he came up with giant lens design without all the internal glass. 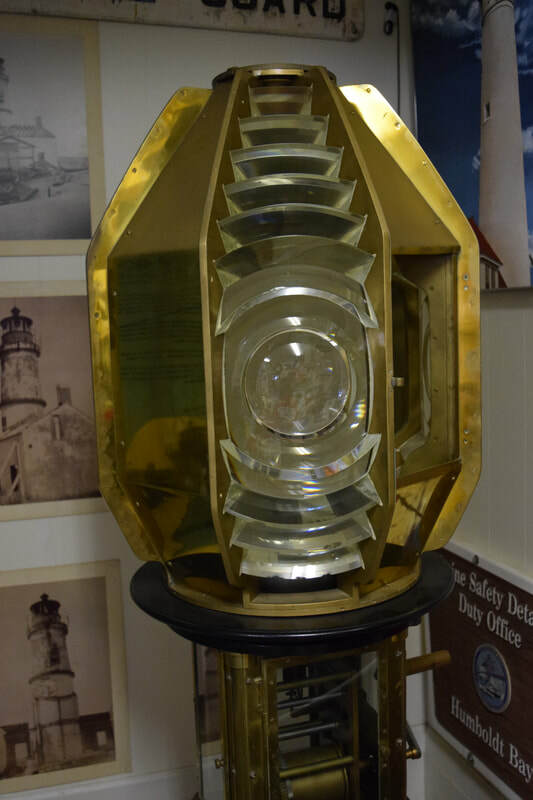 ​This relatively small fresnel lens, from the Table Bluff Lighthouse that was located at the north entrance of the bay in 1856. It was moved to Table Bluff in 1975. The lighthouse was replaced in 1975 with harbor lights. In 1987 the lighthouse building was moved to Woodley Island. Note the clock mechanism under the lenses that turned the light. This lens is the Humboldt Martime Museum in Samoa. Humboldt had/has four lighthouses: Punta Gorda, Cape Mendocino, Humboldt Bay and Trinidad. The Cape Mendocino lens was in the reproduction lighthouse building at the Ferndale Fairground, but was put in storage by the Coast Guard for safety concerns. The Trinidad lens is still in the working lighthouse. The Punta Gorda lighthouse location is a mystery. I have heard local claim it destroyed with target practice and you can find bits of it on the beach near the old lighthouse. The fresnel lens factory in France was bombed during World War II and never rebuilt.